Over the past 49 years, Fastenal has grown from a small-town fastener shop, to a thriving regional business, to North America’s largest fastener distributor, to the world’s most efficient supplier of OEM, MRO, and construction products. Along the way, we’ve never wavered in our belief that great service starts with being close to our customers, which is why today we operate nearly 2,700 branches spanning all 50 states and 20-plus nations. You’ll find Fastenal branches in cities like Houston, Indianapolis, Atlanta, Toronto, and Shanghai. But what really matters is that you’ll find a Fastenal branches near you — ready to stock your products, manage your inventory, respond urgently, and provide the kind of customer service you just can’t get from a catalog or 1-800 number. From one store to nearly 2,700 and counting – We Are Where You Are. After surviving the typical struggles of a startup business, Fastenal gradually found its niche – by going the extra mile for customers and providing the kind of service that kept them coming back. Kierlin later drilled this approach down to four simple words: Growth Through Customer Service. A stringent quality management system anchored by our engineering teams and testing laboratories around the world. Thousands of manufacturer-partners, making each Fastenal branch a one-stop source for a huge range of OEM, MRO and Construction products. A multi-site custom manufacturing division, quickly producing machined, hot forged and cold formed parts to provide solutions for our customers. Regional distribution centres across North America, working with local branches to anticipate customer demand and keep product flowing when and where it's needed. A large fleet of big trucks and local delivery vehicles, enabling us to move product faster and more cost-effectively than the competition. The world’s largest industrial vending program, FAST Solutions, helping thousands of customers reduce consumption and operate more efficiently. And at the heart of it all: 2,600-plus Fastenal branches spanning all 50 U.S. states, Canada and Mexico, with additional locations in Central and South America, Europe and Asia – each striving to be the best industrial supplier in the market it serves. Want to delve deeper into the Fastenal story? 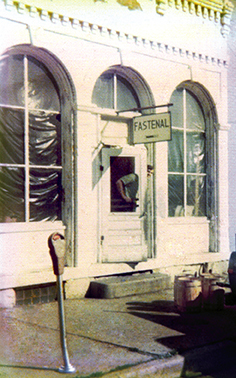 Watch this video about the history of Fastenal.